The upstart Brooklyn based Topps company carefully planned their attack on Bowman’s dominant position in the baseball card market. The 1952 Topps Baseball Cards were the first set that was issued in six series. Each series was carefully proportioned with a fairly equal number of stars and players from each team. The 1952 Topps cards were 52% bigger in size than the 1952 Bowman cards and had 61% more cards in the set. Topps clearly saved the best for the last series that aimed directly at their hometown and biggest market. Series #6 was a Who’s Who of Gotham stars starting with the first card in the series, #311 Mickey Mantle. This was followed by #312 Jackie Robinson, 1951 Giants “Shot heard around the world” Hero #313 Bobby Thompson, #314 Roy Campanella and #315 Leo Durocher. Most people can name the most valuable post-war baseball card as the 1952 Topps #311 Mickey Mantle, but few realize that it was "double printed", which means that the printed sheets contained two Mantle cards and twice as were printed when compared to normal cards. (The first three cards of the 6th series were double prints.) One can only guess what the value of Mickey's 1952 card would be if it were not a double print! These cards were soon followed in the 6th Series by more stars from New York City, such as Bill Dickey and the rookie cards of Gil McDougald, Joe Black, Hoyt Wilhelm and Boston’s Eddie Mathews. Unfortunately, most collectors would never get a chance to purchase these great cards of Series 6. Many retailers, who had not yet become accustomed to late season attraction of the super stars in the last series, refused to buy more product in September and did not place orders for the sixth series of cards. Dean’s Cards is currently offering the best selection of 1952 Topps cards that we have ever seen. We have just added about 400 of the 1952 Topps baseball cards to our inventory, including many high numbers. Although the cards vary in condition, many grade PSA 6, PSA 7 and PSA 8. One of the #261 Willie Mays came back as a PSA 7.5! PSA graded the Mantle as a 5, which is a joke. (In my humble, yet biased opinion.) If it were any other card, it would bet it came back as a 6 or 7. Please feel free to take a look at the scan and video and see if you can see a flaw. The very nice 1952 Topps Reprint set is available at Dean’s Cards for the budget collector. The 1952 Topps Reprint Baseball Cards are an affordable way to buy a Complete Set or build a Team Set at an affordable price. 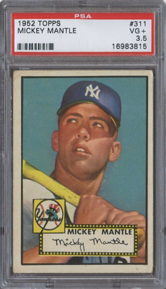 Here is your chance to own a 1952 Topps Mantle. 407 cards. Issued in 6 series. Innovations: Largest card size to date, Largest set in number of cards, Color Team Logos, detailed player statistics and stories. I am 49 years old, and I wirh I new then what I know now about baseball cards, becouse if I did I never would have gotten rid of them. so now that I know a bit more about card colecting, I am starting A card coolection for my 4 yr. old son, So that maybe he will have somthing that I can only wish I had thank you. Sincerely MR.Salvator Brindisi SR.